YiEr international Commercial Business Hotel is located in Nanchizi Street on the east of Forbidden City, which is luxury and pure Chinese style. There are two floors, 11 rooms. Including Standard room, special room, luxury room, lovers room and so on. The hotel is elegant, comfort, scenery around is very beautiful, and fitment is also top-rank, the standard is four stars. Each room has its own characteristics, it has IDD, internet, TV, air conditioning, 24 hours hot water and so on.. The most advantage of this hotel is its inimitable location, it is surround by famous places. On the west, working peoples culture palace stands there; Wangfujing streets is on the east; There is Donghuamen night market and Pudu fane on the north; Moreover, Tiananmen square, Qianmen street, national theater and Temple of heaven are all on the south. We will provide you various Beijing traditional cultural magazines of English version; you can read or buy it mail-order. We also help you to buy tickets for Beijing opera or acrobatic show, meanwhile, we will provide commentator for you. We also offer guide and cars for your travels in scenic spots and Hutong in Beijing, 24 hours dinner, business center service like internet, copy, fax, print, IDD and DDD, tickets order, money-exchanging and so on. Lease of whole hotel is on service too, including dinner, conference, entertaining and accommodation. sometimes you can make dumplings with us or BBQ with us. It has IDD, internet, TV, air conditioning, 24 hours hot water and so on.. Including Standard room, special room, luxury room, lovers room and so on. Wangfujing Street. Forbidden City, Tiananmen Square, Xidan street. The hotel is located in Nanchizi Street, East side of Forbidden City. 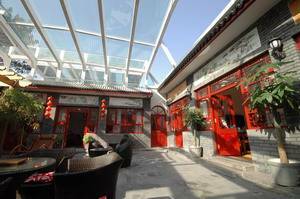 Advantaged location will make you very convenient to enjoy Beijing. West of the hotel is Forbiden City and Working Peoples Cultural Palace, Wangfujing Street is on the east. You can visit the national theater; Xidan shopping mall and Houhai anytime even by bicycle. Our hotel is surrounded by Changpuhe park and historic site of Forbidden Citys circumvallation. The scenery is so wonderful that you will surely be attracted. Taxi :Capital International airport station, to No. 1 yard Denglongku Hutong Nanchizi Street. Whole distance is 28 kilometers. charge 70-80 yuan. Ariport Bus :Take the Ariport Bus from the Capital International airport to Xidan(charge 16 yuan), change taxi to No. 1 yard Denglongku Hutong Nanchizi Street. Whole distance is 2. 5 kilometers. charge 10 yuan. Subway&#65306;Take 2 route to JianguoMen , then change the 1 route to Tiananmen East. Bus:Take bus No. 52 to Tiananmen East station from the Beijing West Station, Then go to the hotel on foot. Bus: Take bus No. 20/692 to Tiananmen East station from the Beijing West Station, Then go to the hotel on foot.